Utforsk Stockholm fra byens vannveier på denne 50-minutters turen med kanalbåt. Cruise gjennom de sentrale øyene i byens skjærgård og slapp av mens båten passerer bydelene Södermalm og Slussen på vei ut mot den grønne, fredelige øyen Djurgården, hvor du finner Prins Eugens Waldemarsudde-museet og Vasa-museet. Få med deg utsikten over Fjäderholmarna, den første øygruppen i skjærgården, og panoramautsikten over bylandskapet på vei tilbake til Stockholm sentrum. Velg et tidspunkt som passer din reiseplan. Båten har avgang hver time. Velg et tidspunkt som passer for deg og gå deretter ned til Strömkajen. Båten har avgang hver time. Gå om bord og finn en plass å sitte under utfarten. Slapp av og nyt den friske luften på vei bort fra sentrum mens du lytter til turens lydkommentarer. Gå ikke glipp av øyens fredelige, løvrike bredde når båten kjører inn i Djurgårdsbrunnskanalen. Denne øyen er hjem til Vasa-museet, et sjøfartsmuseum som stiller ut et skip som sank på jomfruturen sin i 1628, og Prins Eugens Waldemarsudde-museet. Mange av Stockholms innbyggere kommer ut hit for å tilbringe fritiden sin her. Seil rundt Fjäderholmarna, den første øygruppen i skjærgården som strekker seg ut i Østersjøen. På vei tilbake til Stockholm sentrum kjører båten forbi den travle bydelen Södermalm, et av de mest tettbefolkede områdene i Skandinavia. Deretter kan du betrakte det hippe Slussen-området, som ligger ved en elv som forbinder Södermalm med Gamla stan, Stockholms gamleby. Nyt den fantastiske panoramautsikten over byen under avslutningen på det 50 minutter lange cruiset. A great tour with bite size information on the whole of Sweden. Great for people who are rushing for time but do not want to miss knowing Sweden's history. Just feel that unlike the other tour with Viator, this lack personal touch. We are also unable to ask questions for places we are more interested in. We really enjoyed this introductory tour of Stockholm. Headsets provide multi-language options. 50 minutes is a nice time to be on one of these low profile motorized barges that are able to pass under the low bridges. Recommended. Great way to get a lot of Stockholm info in a short time. Was a wonderful jumping off point to see what we were interested in. Me ha gustado mucho. Fue una excursión muy interesante. Enjoyable - even though it was -4C outside! Scenery beautiful in the snow - would like to see it again in summer. On time, good audio information. Initially I had a hard time finding a boat tour at all signing up from the US before I got there, as Viator only listed days and dates that didn't really suit my planned activities in the fall, many museums and historic sites have abbreviated hours or are only open on the weekends or only on the weekdays so you end up juggling your schedule. I had signed up for this canal tour on a particular day, but when I was in Stockholm I ended up near the pier the day before after visiting a museum. On a chance I went to the office and asked if they would honor my ticket for the next day and let me go then and there, and they were very flexible. This made a huge difference to me I was able to go on long day trip the next day. So, very nice staff! You shouldn't leave Stockholm without a boat trip or six....It is such a beautiful city and you can't appreciate it fully without seeing it from the water. My one frustration is that parts of the actual canal part of the route are not the most thrilling. You do see some interesting things but there's a rather slow, dull stretch when you are smelling engine fumes. It's nicer when you are in more open water. However you do see some nice views of parts of the city you could see no other way. The best boat trips around Stockholm are mostly seasonal or were on days of the week when I was not there. Summer time is the best, tho I think there is one winter one that might be beautiful for hardy sorts. WE thoroughly enjoyed our canal ride. However, we were told by Viatour that we could walk to the viatour location from our ship in approximately 15 minutes. However, this was INCORRECT INFORMATION. It would have taken over 40 minutes and we had to take a taxi. Also, we would have loved to sit outside on the back of the boat, but no one told us and we ended up inside having to take photos through the window. 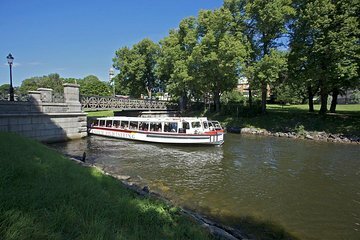 A lovely 50-minute boat trip around the canals of Stockholm with a guided audio tour complete with an onboard bistro. Very easy to find on the main harbour, and with tours departing on the hour you can simply pick and choose your desired time to fit in with your schedule...couldn't be any easier!